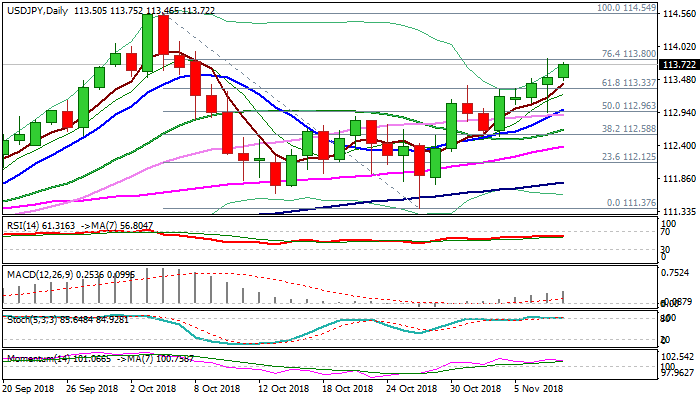 The pair holds positive tone in early Thursday’s trading and looks for retest of Fibo barrier at 113.80 (76.4% of 114.54/111.37) which capped previous day’s attack. Long-legged Doji was left on Wednesday after the action was rejected on both sides (Fibo barrier capped upside attempts while dips were contained by daily cloud top), as the greenback was on bumpy ride after results of US midterm elections were announced. The greenback regained traction after being initially sold on concerns about split power in US congress, keeping bullish bias. Bulls need clear break above 113.80 pivot to spark fresh acceleration through 114.00 (round-figure / option barrier) and possible extension towards key barrier at 114.54 (04 Oct peak). But sideways-moving momentum and overbought slow stochastic on daily chart warn that bulls may run out of steam again. Broken Fibo 61.8% barrier now acts as solid support at 113.33, with extended dips to remain above daily cloud top (113.01) and keep bullish stance.